A handcrafted bookmark is a wonderful way to make a simple, but thoughtful gift. They make great stocking stuffers and perfect last minute tokens of appreciation. 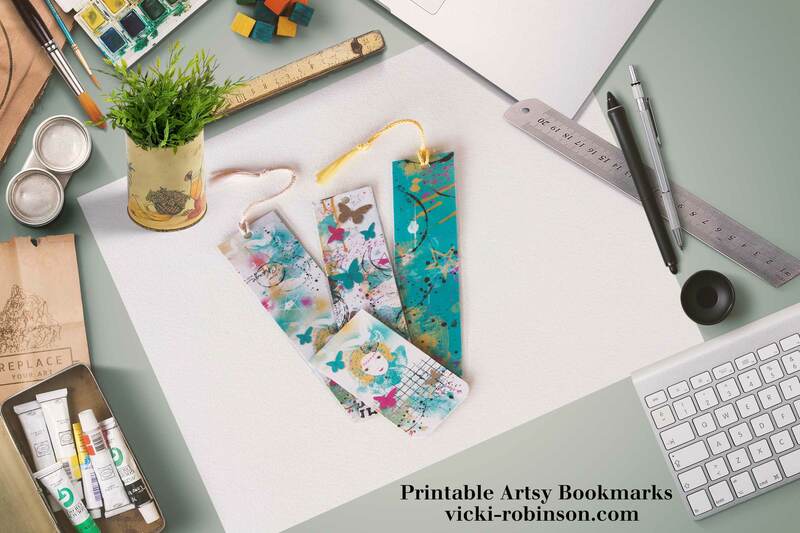 Today, I’ve got two kinds of bookmarks for you – the straightforward kind of bookmark you usually see and a magnetized bookmark for something a little more special. Whichever bookmark you choose, the recipient is sure to be delighted. Each of these projects start in the same place – by printing the bookmarks I’ve provided for you – the link is below. The download includes PDFs for both U.S. Letter and A4 sized paper. You can print the PDFs as they are, or, if you’re feeling especially creative, you can open the included PNGs of the bookmarks in your photo editing program (Photoshop Elements or the full version of Photoshop) and add text or other elements to personalize the bookmarks – just print them out and follow the instructions for assembling them. Or, if you have art supplies, you can easily add your own finishing touches – ink the edges, add handwritten names, etc. Self-adhesive, business card-sized magnets (2 in x 3.5 in each) available in an office supply store, or your can get them on Amazon. You could also use magnet sheets and cut them to size, but the bookmarks I’ve provided are 2 inches wide, so it found it easier to use the business card size magnets. Load the card stock into your printer. Open one of the PDFs. Be sure your print settings are set to to “borderless printing” and if you can choose card stock or heavy weight paper as your media, do so. The Magnetized Bookmarks don’t need to have print on both sides – just print Page 1 of the PDF and follow the instructions for Magnetized Bookmarks below. For the Super Easy and Laminated Bookmarks, you’ll want to have print on both sides, so print Page 1 and when the ink is dry put the page back in the printer and print Page 2 on the opposite side. You’ll need to experiment with your printer to determine exactly how to turn the paper to print on the reverse side. On my HP printer, I turn the printed side down and insert it back into the printer with the top of the already printed side going in first. Cut out each of the bookmarks using either a paper cutter or scissors. Punch a hole at the top in the center of the printed/cut out bookmark. Thread your ribbon, string or tassels through the hole, tie a knot near the hole (or loop the hassle through itself) and voila! You’re done! If you want to laminate the bookmarks, skip this step for now. Start with the printed and cut out (but not hole punched) bookmarks. Peel the backing from one laminating sheet and lay it on a flat surface, sticky side up in a “landscape” orientation – widest side at the top. Carefully place each of the bookmarks on the sheet – it’s very sticky, so once you’ve placed one down, it’s not going to move easily. Space them at least half an inch apart. It’s ok if they don’t line up with each other. Peel the backing from the second laminating sheet and, starting on one side, very carefully place it on top of the bookmarks. Work slowly and don’t worry if it is not exactly square on top of the other sheet – the goal is to lay place the top sheet smoothly and not create air bubbles as you do so. Again, its very sticky so be careful. Use your hands to press the top sheet down firmly, especially over the edges of the bookmarks. If necessary, you can use a bone folder or a ruler to press out any air bubbles. Cut out each of the bookmarks, leaving about an eighth of an inch border of the lamination around each. If you cut too close to the bookmark itself, the lamination won’t stick. Punch a hole at the top in the center. Thread your ribbon, string or tassels through the hole, tie a knot near the hole (or loop the hassle through itself) and you’re done! These bookmarks are my favorite – the magnets make sure the bookmark stays in place! Start with the printed bookmarks (just the front side – Page 1) and cut out (but not hole punched )bookmarks. 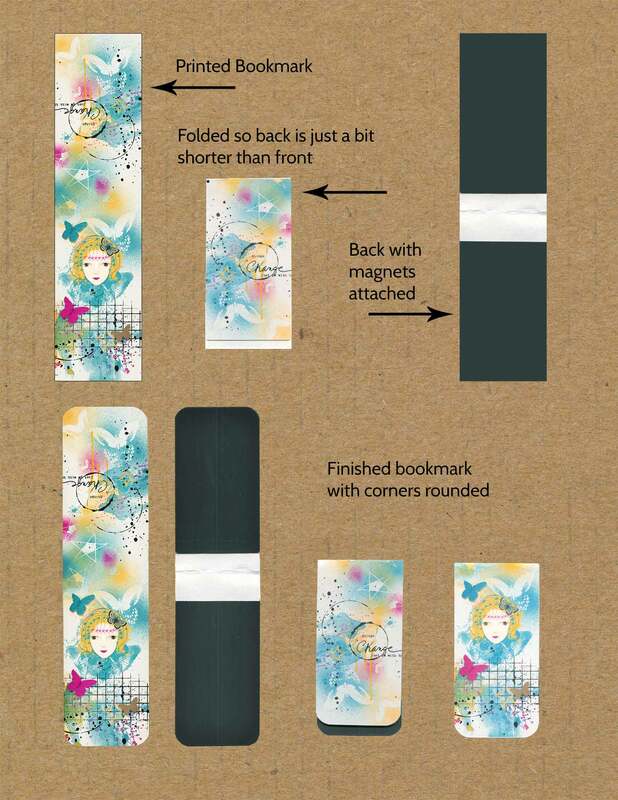 The magnets are quite strong, so to make sure it’s easy to separate the halves of the finished bookmark, fold each bookmark so that one side is slightly shorter than the other. Unfold and lay the bookmarks printed side down on a flat surface. Peel the backing from one the magnets and adhere lengthwise to the bottom edge of the bookmark. Repeat with the other end of the bookmark. If desired, finish each corner with your rounder! You’re done! The graphics used on these bookmarks are from my “Express Yourself:” kit. This is a fabulous kit, Vicki! I’ve already loved playing with it and think the bookmark (esp. magnet one) is great! Thanks for the tutorial. Thanks, Ann! I’m so glad you like the kit and I hope you try out the magnetized bookmarks! Maya was right!!! Love the kit and this tutorial!!! You are awesome!! !